Standing just 4¼ inches high, and shimmering with pastel marigold iridescence, the exquisite little vase on the left of the two pictured here was found in 2014. The vase is illustrated in the catalogues of the Polish maker, Hortensja, and we named it Athina (with an “i”) to acknowledge its similarity to a pattern called Athen, which was made by the German maker, Walther. Soon after our discovery in 2014, two more sizes of the Athina vase were reported in marigold – standing around 6 inches and 8 inches high. But the Hortensja catalogue showed there was another size – 10 inches! And now we can confirm it in marigold. This image is from “The Butler Way of Window Trimmer”, which was a booklet for merchandisers that was issued in 1912 by Butler Brothers. Can’t you just image this window display full of Carnival. Many of the shapes shown here are so familiar. 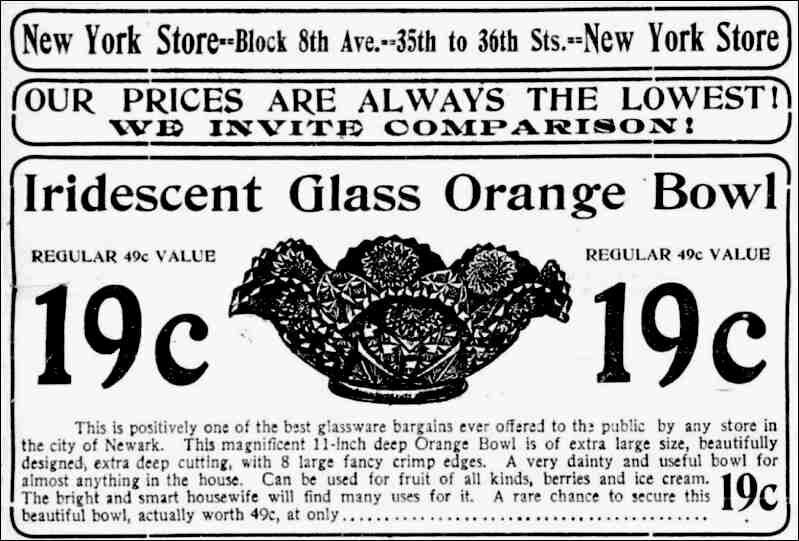 ​The ad on the right is from 1911 and it was offering an “Iridescent Glass Orange Bowl”. 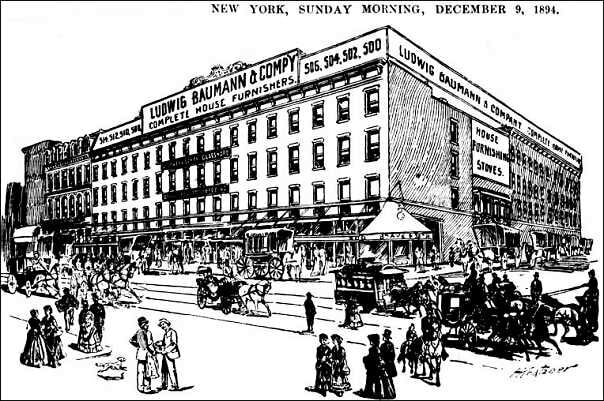 The store selling the bowl was Ludwig Baumann & Company a furniture store on Market Street, Newark, NJ. They styled themselves as “America’s Greatest Furniture House” and had large stores in New York and Newark. 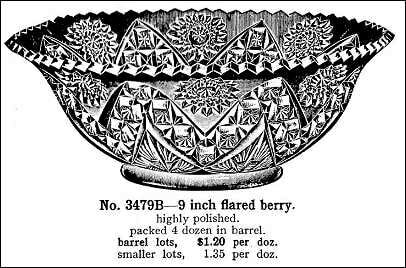 It’s a magnificent bowl, and the icing on the cake for shoppers was a store promotion for double S&H Green Stamps*with purchases made in the morning (just single stamps after noon). But ... what exactly is the bowl shown in the ad? We know that it was made by Imperial as the item was illustrated in their 1909 catalogue as their No. 3479 (shown below). The pattern is sometimes called Star Arch or Hobstar Zigzag. But here’s the big question … have you ever seen this pattern in Carnival Glass? ​We certainly haven’t … and yet there it was, described as an “Iridescent Glass Orange Bowl” in a 1911 ad. ​What might the answer to the mystery be? Perhaps the Imperial factory supplied the store with the wrong illustration, or perhaps Ludwig Baumann & Co simply got it wrong. ​Or could it be that that there actually is a Carnival example of this bowl in existence somewhere? Ludwig Baumann & Company, Market Street, Newark in 1894. Do you have one? If you do, please send us a photo and we will include it in the next issue of NetworK. * S&H Stamps - the reference to S&H Stamps in the 1911 ad reminded us of an article we wrote a while ago about the use of Trading Stamps, Coupons and similar incentives to promote the sale of Carnival Glass all around the world. Take a trip back in time to the heyday of Trading Stamps and Coupons here: Stamp of Approval. For some reason, fish hardly featured as design motifs on Classic Carnival Glass. Relatively few patterns spring to mind - they are Big Fish, Trout and Fly and Seacoast Pintray (all three from Millersburg), Fish Vase and the variants (Jain and other makers in India), Fisherman's Mug (Dugan and also Contemporary Fenton), Golden Carp (Zabkowice), and Little Fishes (Fenton). Above: a spectacular lavender Millersburg Trout and Fly bowl (the fly near the fish's mouth distinguishes the pattern from Big Fish). Collectors of Contemporary Carnival have a wider choice, as makers used fish as actual moulded figurines. They have a rightful "plaice" (sorry!) in Carnival design. Above on the right, are two of Fenton's very popular fish designs in Contemporary Carnival - the Carp (left) in a pale amethyst / lavender colour, and the Sunfish in red / amberina. On the immediate right, swimming around the other side of the Atlantic Ocean, is a fairly rare Contemporary Carnival fish made by Isle of Wight Glass. Carnival collectors have an unusual habit of looking at the underside of the base when examining a piece of Carnival ... and for a very good reason, as it can often tell you a lot about the piece and its maker. As we have shown before - it can also be a big surprise! Take this Classic Fenton Peacock Tail hat in green (below). It is a lovely piece, but it could go unnoticed on a shelf. If you see one, do pick it up, and look at the base - just in case! Fenton used this Peacock Tail hat shape for several Advertising / Lettered pieces. This one was for Arthur F Odell Quincy Jewler. ​Interestingly, there is debate over the word "JEWLER" - was the missing 'E' a mistake? Did the mouldmaker not have enough space? Or ... was it intentional?In fact, "jewler" was an accepted spelling as well as "jeweler" and "jeweller". Researching these Advertising / Lettered pieces and the actual businesses that were forever captured in glass provide a fascinating look into the way Carnival Glass was promoted and sold back in the day when it was made. A warm welcome to all our many new joiners! Every month, we add new joiners who want to receive our NetworK ezine, and in fact this issue is being sent to our largest ever number of Carnival and glass enthusiasts all around the world. It truly is a very special "network" of people who share a love of the glass, its makers and designs, its origins, and the incredible social history associated with its production. A BIG THANK YOU to all! Some of our more recent joiners may not know that all the Back Issues of NetworK are posted on our website. There are many, many hours of fascinating reading. Here is the link: NetworK Back Issues.